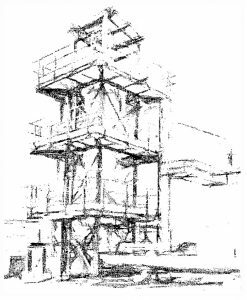 The hydrothermal carbonization process (HTC) was first described by Friedrich Bergius in 1913, but its industrial application was not developed due to the rising importance of oil. The application of HTC process for biomass treatment was researched and developed by Prof. M. Antonietti at the Max Planck Institute of Colloids and Interfaces (MPI) recently published their findings in 2006. Up to date, the process turns out to be a valid option for the treatment of various types of biomass, both for all types of vegetable biomass (gardening, forestry, agriculture …) as well as organic waste and sludge water treatment. In late 2005, Ingelia SL is officially established. The company’s objective is to develop the Hydrothermal Carbonisation Technology and adopt it at industrial scale. From 2007, thanks to the scientific collaboration with the Institute of Chemical Technology (ITQ) from the Polytechnic University of Valencia, led by Professor Avelino Corma (CSIC), Ingelia operated to develop its advanced, patented industrial HTC plant. In 2010, in September, Ingelia finalized the installation of its first industrial HTC plant, able to process 6.000 tons of biowaste per year, located in Valencia, Spain. 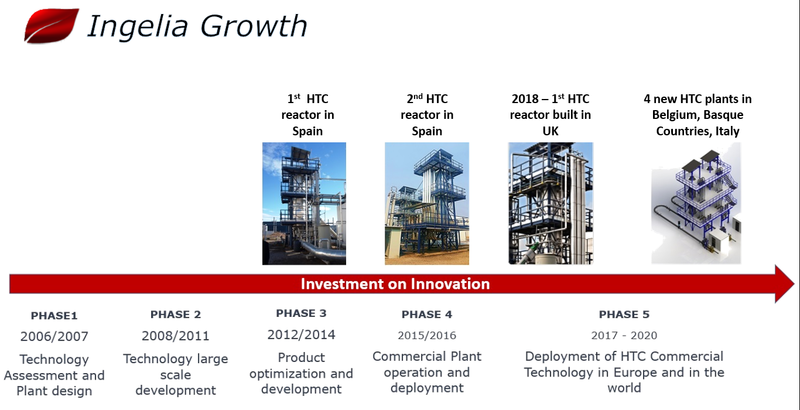 Since 2010, Ingelia worked to optimize and develop the patented HTC technology, making the industrial plant an attractive commercial opportunity. In 2013, Ingelia was financed by the European Commission to start the FP7 project “NEWAPP”. This three years’ project allowed Ingelia to demonstrate the efficiency of its plant as industrial biowaste processing technology, able to upgrade a wide range of substrates, from green waste, to Organic Municipal Waste and Sewage Sludge, into high value biocoal, and liquid fertilizer. From 2014, Ingelia has been working on a strong and efficient commercial expansion, in order to export its HTC technology to other EU and non-EU countries. Ingelia dynamic partnerships are operating in Italy, UK, Canada, Belgium, Poland, and Portugal. In 2017, Ingelia, thanks to its partner CPL Industries, started building its third industrial HTC reactor in a new HTC plant. The reactor , located in UK, will be put in operation in 2018.